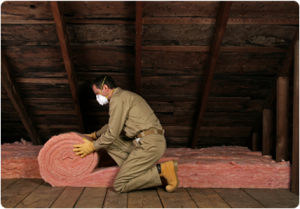 Attic insulation is a material that prevents your home from extreme temperatures. This applies to both hot and cold weather. This material is put in the space located between the ceiling and the roof of your house. It makes sure your house remains at your desired temperatures. Attic insulation can be energy saving as it reduces the use of thermostats which use up energy. There are three main methods of attic insulation; rolls method, blown-in method, rigid foam insulation. This type of attic insulation is also referred to as blankets. This type of insulation is common in attics with a large standing space. The insulated materials are in rolls just as the name suggests. On top of these rolls is a reflective material or a paper lining. The reflective material is used to reflect away heat. The insulation material is used to absorb the rest of the heat not reflected away by the reflective lining. The materials used in this type of insulation are fiberglass and rock wool. This type of attic insulation is also referred to as loose-fill insulation. It is generally preferred because it is more cheap and economical. It is also easy to install. It works well in empty spaces hence it makes it easier to protect hard to reach areas. The materials used in this type of insulation are fiberglass, rock wool or cellulose. In this type of insulation foam pieces are put in place. It is considered to be one of the most effective insulation methods as the foam materials are so dense. It can be very difficult to install especially if it was not considered as the building was being constructed. The materials used in this type of insulation are polystyrene or polyurethane. Can be installed as batts (already cut sections) or rolls (continuous lengths). Insulation is measured in terms of R-value. A higher R-value denotes better temperature regulation. Fiberglass insulation can last a lifetime but it reduces its R-value due to old age. In this case it can be replaced either by placing new fiberglass over old ones or removing the old ones if already contaminated. Batts and rolls can cost between $25 and $75 per square foot depending on the R-value (materials only). Well installed batts and roll by professionals may cost between $50 and $100 depending on your location. Blown-in insulation cost for 535 square feet is $117.50, blown-in insulation labor for 3.2 hours is $168.10, blown-in insulation job materials and supplies for 500 square feet is $18.70 and blown-in insulation equipment allowance is $30.00. The total cost adds up to $334.30. Spray foam is more preferred nowadays due to its effectiveness. It can cost between $1.5 and $3 per square foot. It would cost between $3000 and $7000 for an average sized home. One should be aware of the R-value recommended for their region because cost is mostly dictated by the R-value of the material to be used. Benefits of initially expensive insulation overrides those of cost over time.